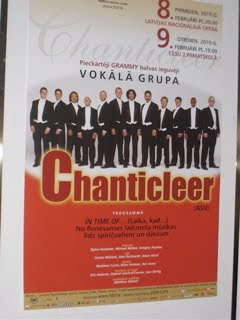 This hotel also has a poster for our concerts (here and in Cesis) prominently displayed at the reception which, along with a good night's sleep and a day off, adds to our restored feeling of comfort. Now about the journey here. This was going to be a post about how Eric, like Colline in La Boheme although not for the same reasons, is about to have to give up his old overcoat, which has seen him through 20 years of Chanticleer travel to cold places and is ready to be retired. 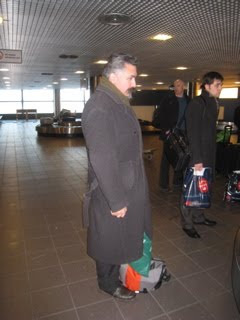 Instead, it's a picture of Eric waiting for his bags at the airport in Riga, neither of which arrived. Epic bummer, even more so as he later had to face the possibility that his skype session with his baby Mia might not be possible. As you now know, the conversation with Mia will happen. One bag was to arrive this morning, and the other one later this afternoon - apparently they never left Brussels. We had left Bruges at 5am to catch a plane to Brussels for the only connection in Frankfurt to Riga (that's why we had to leave so early.) While we all buckled in and went to sleep, the plane sat on the runway for 35 minutes, narrowing the one hour between planes in Frankfurt to a nerve-wrackingly inadequate 25 minutes or so. We arrived in Frankfurt - as usual parking god knows where, bussing to terminal B (being, between C and A the most mutually inconvenient), and running to our gate at A26. The plane was all boarded except for us. Eric, the first arrival, let them know there were 12 people running behind us. We made it, then we sat for 15 minutes due to 'the weather situation' as the Lufthansa pilots say ( heavy mist in this case) then we left and sped over to Riga. This was all so NOT amusing that nobody took pictures, but you've seen it before. Next time we come to Frankfurt, on Thursday, we're actually going to Frankfurt so this story will not repeat itself.